New Delhi, January 09th, 2019: Energy Efficiency Services Limited (EESL), a Super Energy Service Company (ESCO) under Ministry of Power, today announced completion of the project to replace 50,000 conventional electricity meters with smart meters in the New Delhi Municipal Council (NDMC) area. With this, NDMC has become the first distribution company (DISCOM) in India to implement 100% smart metering solution. The adoption of smart meters will enhance consumer convenience and rationalise electricity consumption. 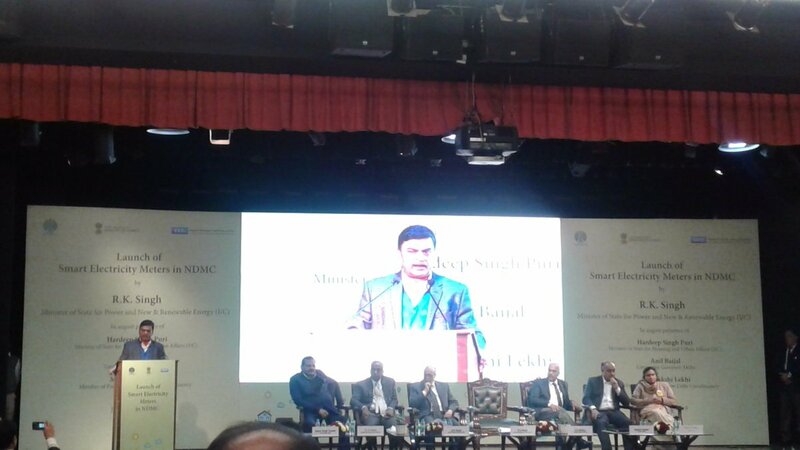 Hon’ble Minister for Power, New and Renewable Energy, Shri R K Singh inaugurated NDMC’s smart meter project, in the presence of dignitaries including Housing and Urban Affairs Minister Shri Hardeep Singh Puri, Shri Anil Baijal, Lieutenant Governor of Delhi; Smt Meenakshi Lekhi, MP, New Delhi constituency, Shri A.K. Bhalla, Secretary, Ministry of Power, Shri. Naresh Kumar, Chairman, NDMC, and Shri Rajeev Sharma, Chairman, EESL.